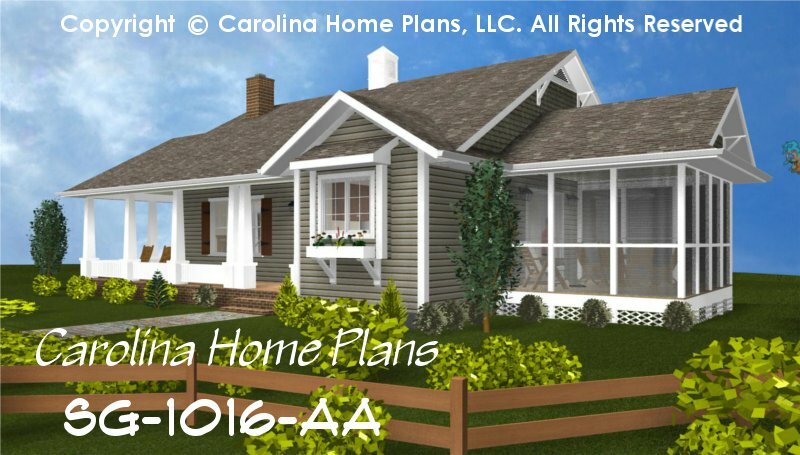 Country cottage styling adorns this one story compact small house plan. Enjoy the spacious, vaulted ceiling living room with access to a charming wrap around covered porch for summer relaxation or easy entertaining. 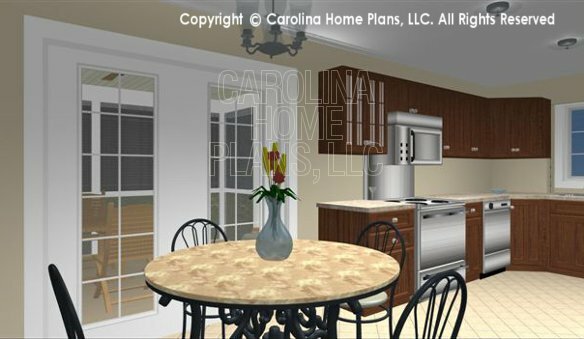 The well-equipped kitchen and large dinette are conveniently located adjacent to an inviting screened porch for maximum outdoor living. 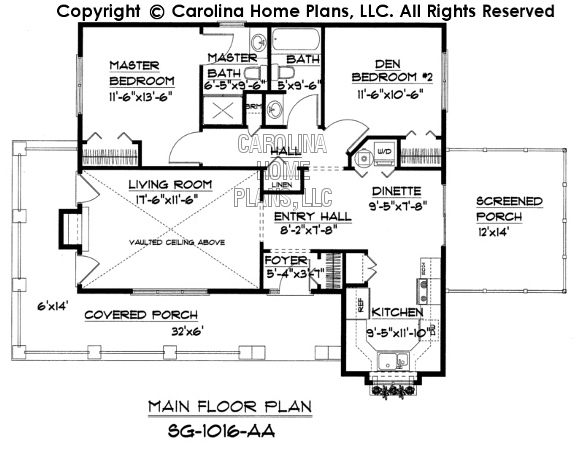 Large windows, an efficient small floor plan and attention to details make this small house floor plan ideal for empty-nesters planning on downsizing without sacrificing on everyday functional conveniences. 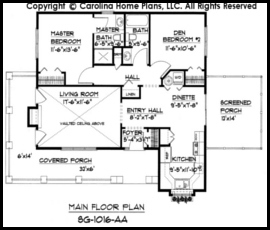 Although designed for ease of mobility and aging in place, this small home floor plan is suitable for anyone seeking compact comfort. Available options and pricing: See below. 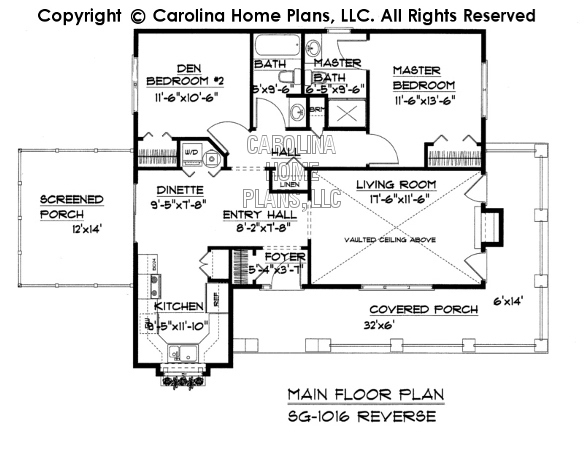 We originally designed this convenient, one story small house plan for a client who wanted a place for her mother. The idea was for her to live safely nearby in a comfortable home of her own on their large property. Her mother, who was getting on in years, would be able to enjoy the comforts of her own surroundings, with her own furniture and family mementos and, yet, be close at hand. Since she used a walker to get around (and wheelchair use was certain to be in the future), designing this small house floor plan to be accessible and adaptable regarding mobility issues was a major consideration. Her hobby was drawing and every so often other family members would come from out-of-state to visit, hence, the study, which we designed to do double duty. Her childhood home had a veranda, so that was a must for her to relax and enjoy a cozy home that allowed her to age in place comfortably. At a later time, the house could be used as either a guest cottage, rental for income or a starter home for the grandchildren.